Have child and have not slowed down! This blog seeks to chronicle the joys and challenges of taking kids hiking, camping, backpacking, skiing, biking, paddling and all-out exploring in the Canadian Rockies. I am thrilled to be participating in the second annual "Thankful for Families" Instagram Contest that begins today!! If you are not on Instagram (yet,) you just might want to create an account for this one! If you don't believe me, scroll down to see the list of prizes you can win. I am thankful for my family, and my group of outdoor family bloggers has worked super hard to put this contest together for you. Have fun with it and we can't wait to see your photos that you share with us. Enter to win the #ThankfulForFamilies #OutdoorFamilies giveaway! 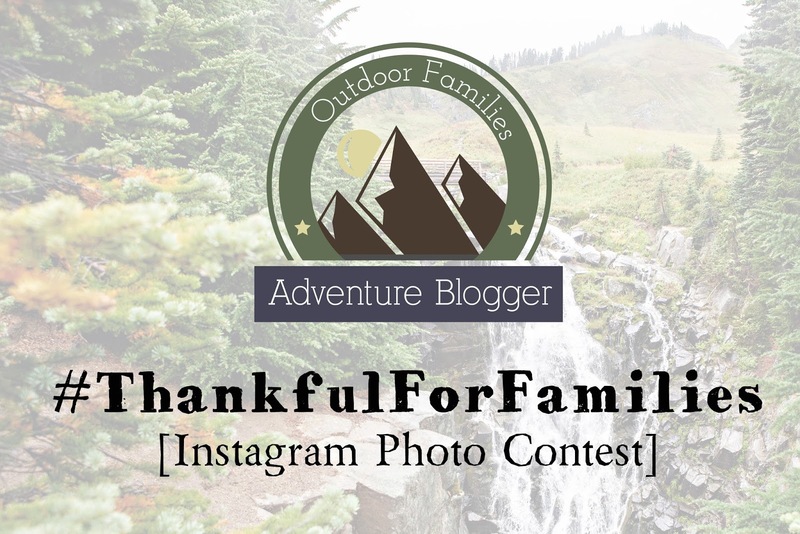 Post a NEW photo of your outdoor family on Instagram making sure to include both #ThankfulForFamilies AND #OutdoorFamilies and tell us why you love your family! Follow ALL of our awesome participating hosts to win! To begin, Tap on MY photo (@MountainMomYYC) to see where to go (who to follow) next. Follow that host, and find THEIR awesome prize in their feed. Tap on their photo to see where to go next. Repeat until you have come full circle and have followed all of us participating in the contest. Check out ALL the awesome giveaways and make a comment (one per photo) on the prize(s) you want to win! Contest will run from November 19-30, 2015. Entrants’ Instagram account must be a public account. Entrants must post a new, original, and taken by you photo (a re-posted photo or tagging an old photo will disqualify you) to Instagam of their family, or members of their family, outdoors. All photos entered in the contest must be tagged with BOTH #OutdoorFamilies AND #ThankfulForFamilies. Entrants must comment on Instagram on the specific prize they are entering to win. Photographs of prizes will be distributed among all the hosts’ Instagram feeds. Entrants need to only comment ONCE per prize. Additional comments DO NOT equal additional entries. Entrants may post a photo once per day to their Instagram feeds for additional entries, up to 12 entries total. All photos must use the two contest hashtags. All photo entries must be submitted by 10 pm MST on November 30th. All winners will be chosen randomly from all submitted entries at the end of the week and announced on each of the blogs after December 1st. Notifying comments will also be left on the winning photos on Instagram. Hosts will do their best to contact winners. If prizes are not claimed within 48 hours of notification, the prize will go to the next winner. This giveaway is in no way sponsored, endorsed or administered by, or associated with, Instagram. Banff Campground Review - The Good, the Bad, and the AWESOME!